Lock in a great price for Hotel Martin & Kristyna – rated 8.6 by recent guests! Excellent location. Ski-bus stop right outside. 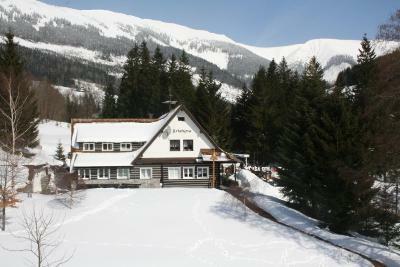 2 Stops to Svaty Petr. 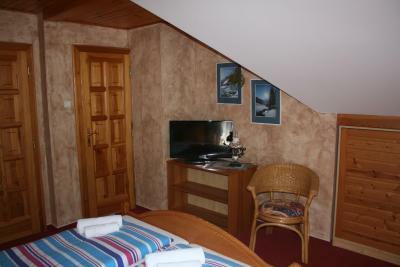 Nice, spacious room, cleaned very well each day. Friendly staff, great food in the restaurant. Excellent breakfast. 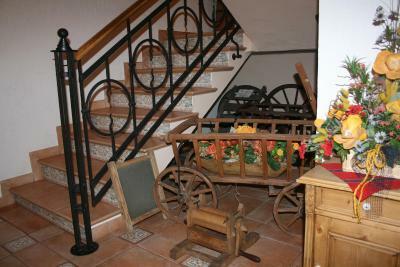 The accommodation was really nice and clean, we also liked surroundings. Very nice and friendly personel. Swift and easy check-in & and check-out. Easily accessible by car with enough parking space. 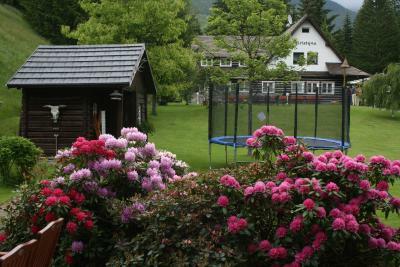 Situated cca 1 km from the center, so perfect for people looking for a quiet place. 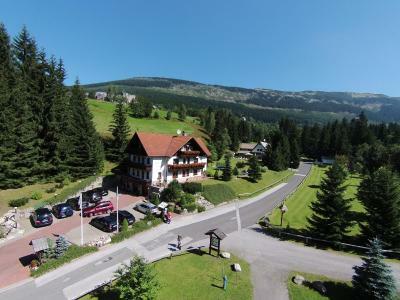 Nice views, quiet neighborhood, friendly staff, skibus station in front of the hotel therefore good connected to Svaty Petr. Very tasty food in the restaurant :) I'll definitely come back. Location, food in the restaurant, big and comfy bed, warm room, gorgeous view, quiet location, plenty of storage, parking, nice bathroom. 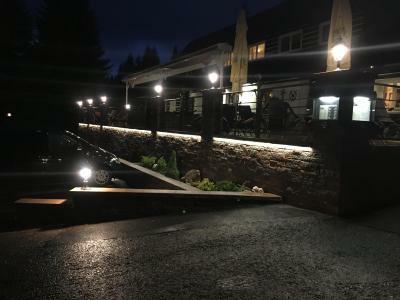 Příjemné prostředí, dobré ubytování, stylový a klidný hotel, dorá dostupnost do centra, příjemný personál. 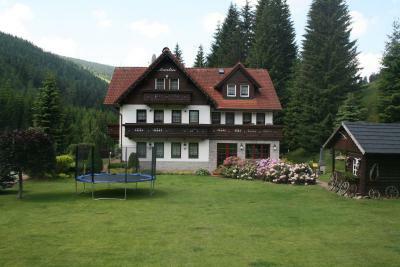 Skvělá kuchyně. 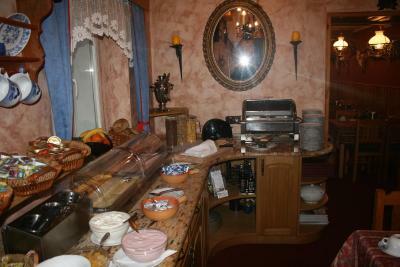 Das Frühstücksbuffet war gut. Nur einen Obstteller hab ich vermißt. Der Kaffee war etwas gewöhnungsbedürftig, aber für den morgendlichen Koffeinkick ok. Das zugehörige Restaurant hatte ein tolles Angebot und alles, was wir in der kurzen Zeit essen konnten, war super lecker. Das Personal war freundlich und aufmerksam. Das Zimmer war gemütlich und für unsere Bedürfnisse völlig ok. Das Bett war bequem, nur die Schlafcouch war ziemlich durchgelegen. Das Bad war zwar klein, aber ausreichend. Toll fand ich die Wanne. Zwar nur eine kleine, aber die müden Muskeln in heißem Wasser entspannen, .... schöner, als nur duschen. Der Chef und das Personal waren freundlich und hilfsbereit bei Fragen. Das Areál Svatý Petr war sogar ohne Bus schnell erreichbar, obwohl dieser direkt vor der Haustür hielt. Doskonała lokalizacja dla narciarzy, ski bus pod hotelem, dobre śniadania i kolacje! Cet hôtel est vraiment bien situé par rapport aux pistes de ski. Un service de bus gratuit vous emmène aux pied des pistes en 3min. Les repas aux restaurants sont très bons. Le mobilier de la chambre est très correct. Le personnel de l hôtel est sympathiques. Tolle Lage mitten in der Natur, etwas außerhalb und ruhig. Ein gutes Restaurant mit schmackhafter, landestypischer Küche und netter Bedienung. Wir kommen gerne wieder ! 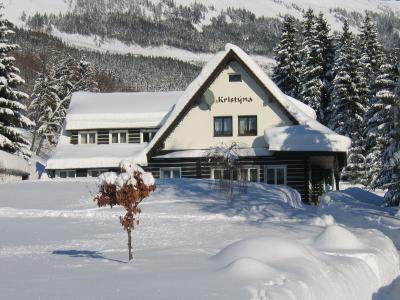 Hotel Martin & Kristyna This rating is a reflection of how the property compares to the industry standard when it comes to price, facilities and services available. It's based on a self-evaluation by the property. Use this rating to help choose your stay! 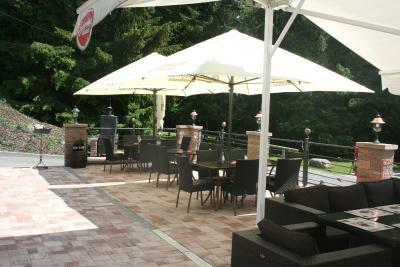 The Kristýna hotel and the Martin hotel form one accommodations facility with great cuisine in Špindlerův Mlýn in the Svatý Petr Valley. WiFi is provided for free in public areas. 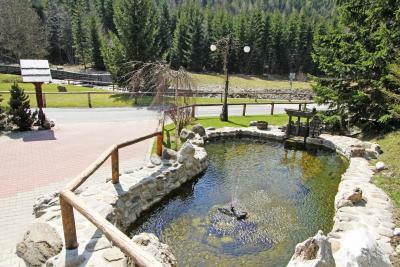 The soothing sound of the Dolský stream can be heard from the Kristýna hotel and you can cool off in the stream during summer. 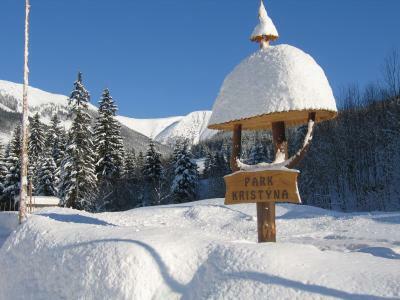 From the balconies and windows you can see the beautiful Kristýna park. If you want to relax, just recline in one of the lounge chairs or simply stretch out on the grass. 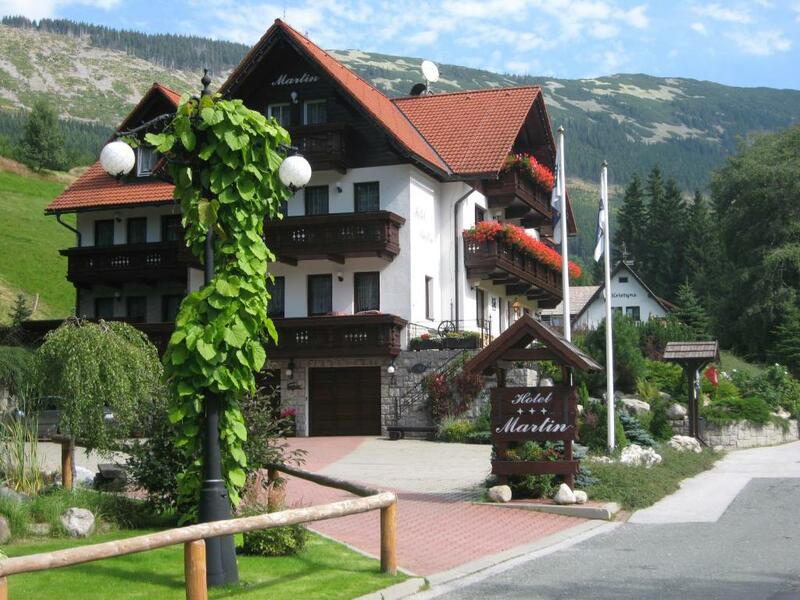 The Hotel Martin is perfectly suited for a quiet vacation and is just 150 feet away from the Kristyna hotel. 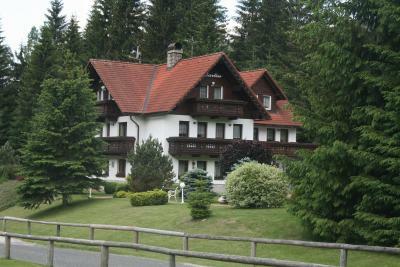 All the rooms at the Martin bed and breakfast hotel have a balcony with a view of Kristýna park as well. 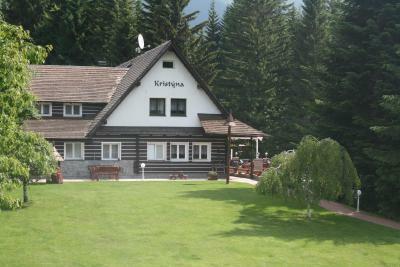 The restaurant in the Kristýna hotel offers delicious food to guests of both hotels. 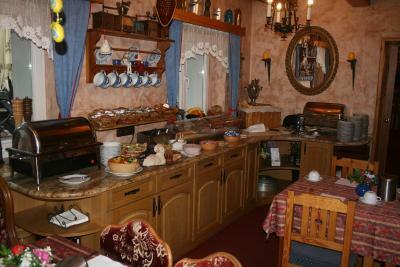 Taste local specialties as well as international cuisine including grilled and smoked delicacies. 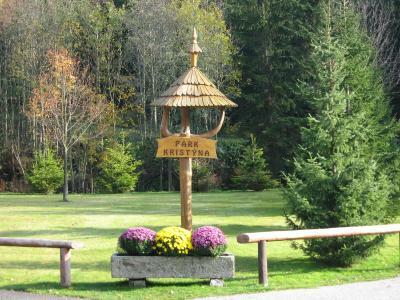 The home-made blueberry dumplings and pies are a must-taste with the blueberries coming directly from the Krkonoše hills. 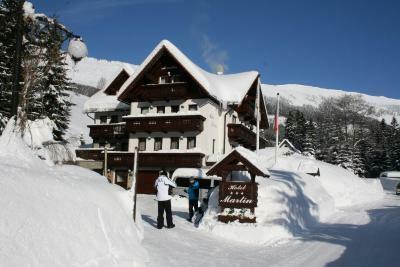 In the winter the road to the hotels is always kept clear and parking is available in front of the hotel. 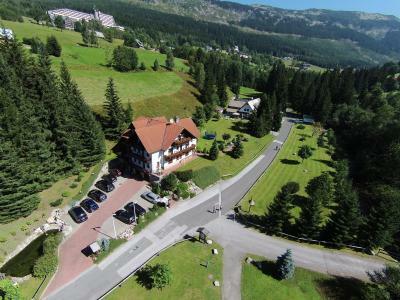 The Kristýna and Martin hotels are a 15-minute walk from the center of Špindlerův Mlýn. 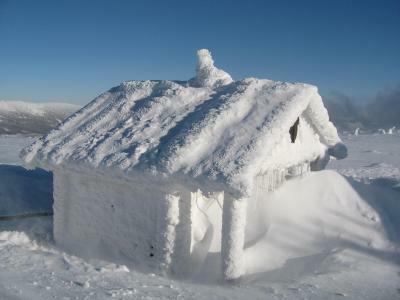 There is a bus service available both in winter and in summer. 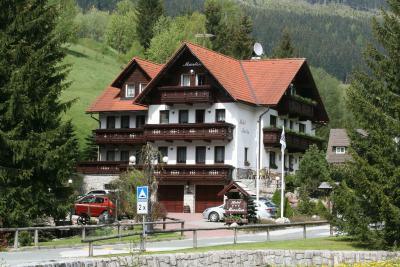 Skiing, hiking or cycling is popular in the surroundings. 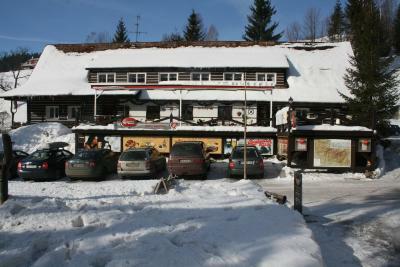 The Medvědín Ski Area can be found 1.2 mi away, and a ski bus stop is directly in front of the Martin Hotel. 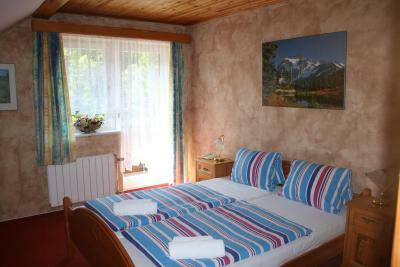 When would you like to stay at Hotel Martin & Kristyna? 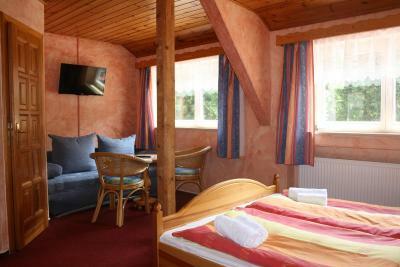 This room includes a private bathroom, a TV and WiFi. This room includes a private bathroom, a TV and a mini-bar. This suite features a balcony, a kitchenette and a bathroom with a spa bath. 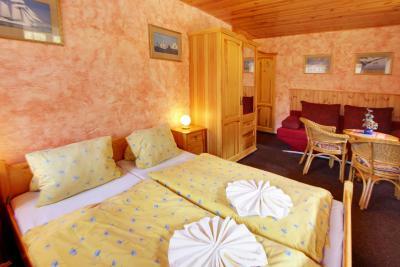 This room consists of 2 interconnected double rooms and it has a balcony, seating area and a mini-bar. 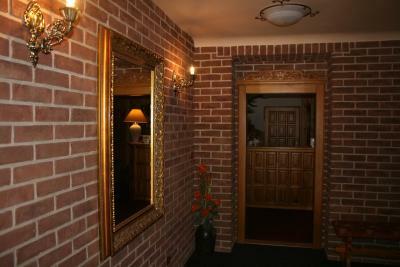 This room consists of 2 interconnected double rooms and it has a seating area. 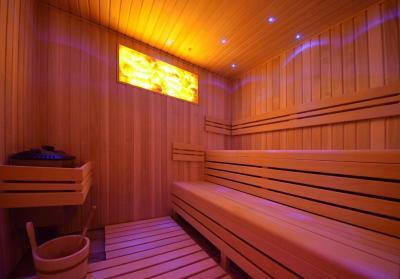 This room consists of 2 interconnected double rooms, featuring a seating area. House Rules Hotel Martin & Kristyna takes special requests – add in the next step! All children under 2 years are charged EUR 7 per person per night in a crib. Hotel Martin &amp; Kristyna accepts these cards and reserves the right to temporarily hold an amount prior to arrival. Hotel Martin & Kristyna accepts these cards and reserves the right to temporarily hold an amount prior to arrival. Food was a bit pricey, for up-country Czech Republic, but I guess you can expect this being right next to the best ski resort in the country. Massive portions made up for it! There were several trifles, nothing serious: 1. Although we found an information (at Booking) that it is possible to pay by card, it is not (not even in the restaurant). 2. The restaurant menu, which is available on the internet, is much more extensive than that you receive in the restaurant (only a few meals and no desserts). 3. 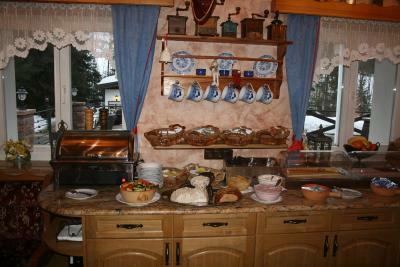 Meal in the center of Spindleruv Mlyn is cheaper. My room was situated on first floor towards the restaurant, therefore it became a little louder now and then - once even after 22:00. So if you are not a night owl, book a room on the other side of the hotel. Overall, a very good place to stay. However, for the price I had paid I’d expect to have a kettle and a couple of mugs in the room; as well as more toiletries beside the basic soap. On the last day we found out on the receipt there is a parking fee and didn't notice it in any hotel description. It's not an issue though, I'd just like to know it before.